This week’s collapse of the Turkish lira has dominated the headlines, and it is widely reported that this and other emerging market currencies are in trouble because of the withdrawal of dollar liquidity. There are huge quantities of footloose dollars betting against these weak currencies, as well as commodities and gold, on the basis the long-expected squeeze on dollar liquidity is finally upon us. Doubtless Triffin’s dilemma is dominating these speculators’ thoughts, telling them demand for the dollar as the reserve currency is infinite. This article points out that foreign financial entities as a whole already possess most of the excess liquidity created by monetary expansion of the dollar since the Lehman crisis. Admittedly, ownership of dollars is unlikely to be evenly distributed across correspondent banks representing all foreign nations. But this is no reason to say dollars are not under-owned by foreign users, and we must not forget dollars are also available in the foreign exchanges, as always, for credible buyers. Nor must we forget that the reason for the enormous quantity of currency derivatives ($75 trillion in US dollars alone) is that future demand for dollars is already significantly hedged. No, the reason certain EM currencies are losing purchasing power is the fault of individual governments and their central banks, who do not seem to realise that their unbacked fiat currencies are valued purely on trust, both that of their own people and on the foreign exchanges. And as we should know, trust is not something to be toyed with. Furthermore, comments that China is in trouble from trade tariffs and being undermined by a strong dollar are wide of the mark. Geopolitics dominates here. America’s occasional successes in attacking the rouble and yuan are no more that transient pyrrhic victories. She is not winning the currency war against China and Russia. China is not being deflected from her strategic goals to become, in partnership with Russia, the Eurasian super-power, beyond the reach of American hegemony. This article looks beyond the short-term rush into the dollar, which is driven predominantly by hot money, to gain a more balanced perspective on the dollar’s future. Collapsing currencies are becoming widely discussed. Until recently, it was Venezuela, once supported by luminaries such as Professor Stiglitz, that hogged the headlines on collapsing currencies. That has now changed because President Trump has started to throw his weight around. The Iranian rial, the Turkish lira and the Russian rouble have all suffered, mainly due to American currency and trade sanctions, triggering a loss of international confidence in their currencies. Even the Chinese yuan, surely that most managed of currencies, is down 9% from its peak in April. With some 180 currencies backed by nothing other than the faith and credit of their issuers, there will always be winners and losers, with more losers than winners when measured against a strengthening dollar. Doubtless, monetary policy has much to do with it, with the Fed leading the way on tightening, and many other central banks not even reluctantly following. 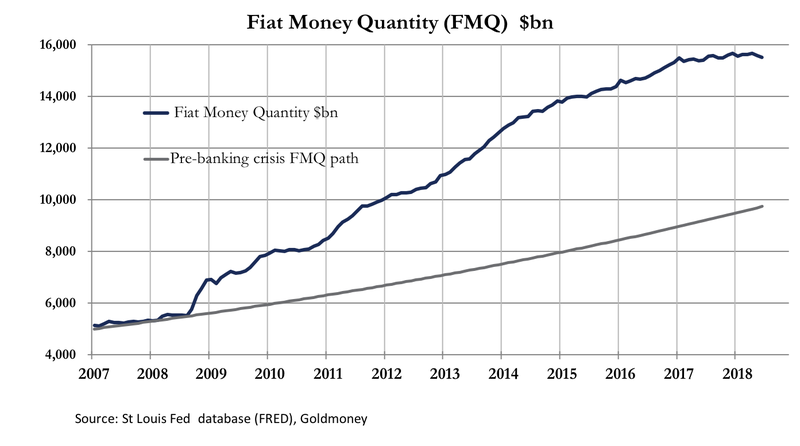 To illustrate how much the monetary environment has changed in recent months, it is worth looking at the fiat money quantity, which is essentially the sum of true money in circulation (mainly cash, checking accounts and deposits) plus bank reserves (commercial bank deposits) on the Fed’s balance sheet. The chart above shows that by last June, FMQ had stated to contract, as the fall in reserves on deposit at the Fed began to bite and the growth in bank deposits has stalled. The chart also shows that FMQ is still $5.8 trillion above its pre-crisis growth path. Despite this, the small rise in the Fed Funds Rate, coupled with the contraction of bank reserves is driving commentators to worry about a developing global liquidity crisis. In last week’s article, I pointed out that since the dollar abandoned all pretence at being backed by anything other than public trust, there has been no correlation whatever between higher interest rates and the rate of monetary expansion. Commentators should therefore look elsewhere for evidence of illiquidity. The contraction of bank reserves on the Fed’s balance sheet involves money not in public circulation, so the question arises as to whether their contraction restricts bank lending. The answer must be an emphatic no, because when reserves totalled less than $10bn through most of 2007-08, there was no problem expanding bank credit. True, there have been rule changes aimed at reducing the maximum level of bank balance sheet gearing, but at just short of two trillion dollars of bank reserves, we are nowhere near bumping into that headroom. The commentary that is evolving is of global dollar shortages, as noted above. Before attributing the collapse of emerging market currencies to the Fed’s monetary policy, we should take the trouble to establish who actually owns the dollar liquidity, at least at the margin. There can be no doubt there is ample liquidity, as shown by the relationship of actual FMQ to where it would be if we hadn’t had the Lehman crisis, illustrated in the chart above. But is it true that foreigners are being starved of dollars? There are two components which should make an analyst sit up and take notice. First, of that $5.8 trillion gap between current FMQ and its long-run growth path, $1.95 trillion is bank reserves on the Fed’s balance sheet. That is the figure the Fed is trying to “normalise”; in other words, reduce it towards the pre-banking crisis level, which was in the low tens of billions. The last date we have for foreign ownership of dollar liquidity was 1 July 2017, when bank reserves at the Fed were $2.33 trillion. At that time, foreign-owned cash and near-cash in the US banking system was $4.217 trillion. Therefore, the sum of bank reserves and foreign-owned dollar bank deposits totalled $6.55 trillion, and FMQ was $6.33 trillion above its long-run trendline. In other words, besides money not in public circulation by virtue of it being parked at the Fed, the difference between the super-inflated level of FMQ and where it would otherwise be without the 2007/08 crisis is entirely due to dollar liquidity in foreign hands. Since then, the US balance of payments has deteriorated a further $570bn adding a potential half-trillion dollars to foreign ownership. Therefore, we can still assume that the excess post-Lehman liquidity in the commercial banks is entirely due to foreign ownership. Official figures put in a new light the general assumption that the rash of currency troubles in emerging market currencies is solely due to the Fed’s tightening. The level of foreign ownership of dollars, is of course, only one factor in prospective currency valuations. US residents’ and corporations’ ownership of foreign assets is another, but their liquid investments in foreign currencies total no more than a few hundred billion dollars equivalent and appears to be mainly hedged through derivatives. Additionally, it should be noted that trade imbalances are the most important factor behind the creation of cross-border currency imbalances, strongly disfavouring the US dollar. From our analysis of dollar ownership, it is clear there is no shortage of dollars in foreign hands. These will be held through correspondent banks in the normal way. Furthermore, when it comes to trade settlement, there is no problem accessing them in the foreign exchanges for credible commercial borrowers. The lending decision is in the hands of correspondent banks, not the Wall Street behemoths. The problems facing countries like Turkey are entirely of their governments’ making, their irresponsible borrowing, and have little to do with dollar shortages. The fact is that modern economic practices, which have jettisoned sound money, have given governments everywhere a carte blanche to indulge in inflationary financing. Pity the ordinary Turk. After decades of near-100% annual inflation, the Central Bank of Turkey knocked six zeros off the lira on 1 January 2005, making one new lira worth $0.74. Today it is only $0.15, having lost nearly half its purchasing power this year alone. It is immaterial to the ordinary Turk that America is playing hardball with Turkey over tariffs. Calls by Erdogan to sell dollars and gold to buy lira cuts no ice with him. He knows his liras are potentially worthless, to be disposed of as quickly as possible. Indeed, loss of confidence in unbacked currencies is the greatest threat to their credibility, a fact which almost all governments and their central banks are reluctant to accept. Central bankers are all trained in mathematical economics, which allows no room for subjectivity in currency valuation, so when their currency is rejected, they are always surprised. The failure of all fiat currencies is probably inevitable, eventually. However, the emergence of these problems today prompt memories of the Asian crisis in the late nineties. Commercial operators in these countries had built industrial capacity on borrowed dollars and Japanese yen, at a time when derivative insurance against currency exposure was less developed. Today’s equivalent borrowers around the world are not collectively exposed to currency risks to the same extent. This cannot be said of governments themselves, which almost without exception have increased their borrowing since the last credit crisis, and that is where the problem lies. Two currencies that have suffered on the foreign exchanges are the Chinese yuan and the Russian rouble. In the latter case, Russia is disentangling herself from the dollar and the Western banking system, which for a country that is the largest supplier of global energy seems bound to end up challenging the dollar’s global trading status. Meanwhile, China’s yuan has fallen nearly 9% against the dollar since mid-April, despite having foreign exchange reserves of over $3 trillion equivalent, mostly held in dollars. China is America’s biggest creditor by far. She could have easily defended her currency, but if she had done so, she would have probably destabilised the dollar. Imagine, for a moment, if China deliberately sells $200bn from her reserves. She doesn’t have to buy only yuan, she could buy euros or yen. Redistributing her foreign exchange portfolio makes sense anyway. However, the geopolitical message from any such action would be potentially catastrophic for US Government finances at a time when its budget deficit is increasing. So why has China chosen instead to let her currency decline? China is probably mulling over a number of considerations. Major-General Qiao Liang, the People Liberation Army’s strategist, informed the Chinese leadership of how the Americans use the dollar as a weapon back in 2015. He recounted how the Americans used a policy of strengthening the dollar to undermine the currencies of its opponents, which is what appears to be happening today. So far, they have failed to undermine China, despite having tried to do so on a number of occasions which he specifically identifies. According to Qiao Liang, China has so far avoided confrontation with the US (he refers to it as a policy of “Tai chi”). Undoubtedly, this continues to be China’s strategy, which explains China’s refusal to be provoked into aggressive action over trade policies. There is a realistic hope that the problem will resolve itself with a compromise, because President Trump may be tempted to secure a trade agreement ahead of the US’s mid-term elections in November. Meanwhile, China’s Tai chi is to allow the yuan to weaken against the dollar, in the knowledge that President Trump is on record desiring a weaker dollar to help make American exporters more competitive and a weaker yuan compensates Chinese businesses for US tariffs. While there are significant problems with Qiao Liang’s analysis, it is valuable as an insight into the Chinese leadership’s thinking. America has already scuppered a potential North-east Asia free trade zone with Japan and South Korea, which would have represented a rival in size to America and the EU. If it had gone ahead, there would have been three global currencies emerging for trade purposes: the dollar, euro and yuan. Therefore, the Chinese leadership sees America’s actions as targeting not just China, but also her future partners in free trade agreements. It is for this reason that China decided some time ago to expand into Eurasia, where the Americans have little political influence. China’s Tai chi is to not stand and fight in the Pacific but to move west. Therefore, while there may be an easing of the Sino-American trade dispute ahead of America’s mid-term elections, the Chinese are prepared in case it fails to transpire. In any event China is likely to step up her plans for expansion westwards, continuing to lend support to her Asian partners, and perhaps to some of her other global interests as well. That support is increasingly likely to involve the deployment of her dollar war-chest. China is probably the largest foreign creditor through her banks of the US banking system, in addition to her ownership of US Treasuries. In deploying these assets, it has always been her style to do so without disrupting markets, but those resources are now needed elsewhere. China has already provided Iran with a lifeline, allowing her to sell oil for yuan, which can be hedged for gold through the futures markets. Turkey is also an important partner in China’s silk road project, giving access to the Mediterranean. Both Turkey and Iran have been driven by America to become client states of China. America by its actions today has already lost them. We now turn to Russia. Russia is the second largest exporter of oil at over 11% of the world total and the largest exporter of natural gas by far. She has deliberately cut herself off from the dollar by selling down her dollar reserves in favour of physical gold. She has established her own bank settlement system alternative to SWIFT, linking into China. Be in no doubt, these are significant measures. The desire to free herself from a weaponised dollar is understandable, but to turn her back on the common currency for pricing energy is likely to have major implications for the dollar’s future status. It probably explains why, underneath the rhetoric, America is using every excuse to destabilise Russia’s finances. Energy sales to Europe can be paid for in euros, and sales within Asia can be paid in yuan and roubles. But the secondary message appears to be this: Russia must believe it can win the financial war against America, perhaps with China’s tacit support. If this is the case, the dollar will quickly lose its hegemonic strength and will destroy itself. To protect herself from this inevitable outcome, she must learn to do without the dollar, and protect her own currency with gold. For now, and probably for only a few months ahead of the US mid-term elections in November, President Trump is forcing currency difficulties on his enemies by aggressive trade policies, including sanctions, and by weaponizing the dollar. It is a trick that has been used by successive American administrations for a considerable time. The Chinese are particularly wary of a currency war being waged against her yuan and are unlikely to escalate tensions unnecessarily. They are playing for and winning a longer game. President Trump’s actions over trade, which appear to have some short-term successes, are driving countries away from her sphere of influence. Ultimately this will prove counterproductive. Speculators buying into Trump’s short-termism and the Fed’s normalisation policies are for the moment driving the dollar higher, without realising that foreigners, far from suffering from a shortage of dollars, already own all the excess dollar liquidity created since the Lehman crisis. This seems certain to lead to the dollar’s downfall. Therefore, the dollar is rising only on short-term considerations, driven by nothing more substantial than speculative flows. Once these abate, the longer-term prospects for the dollar will reassert themselves, including the escalating budget and trade deficits, record levels of foreign ownership of the dollar, and rising prices fuelled by a combination of earlier monetary expansion and the extra taxes of trade tariffs. And if that’s not enough, the erosion of its hegemony coupled with China’s future demands for infrastructure capital seem bound to lead to a fundamental reallocation of capital to the detriment of the dollar. No wonder China and Russia decided to corner the market for physical gold.